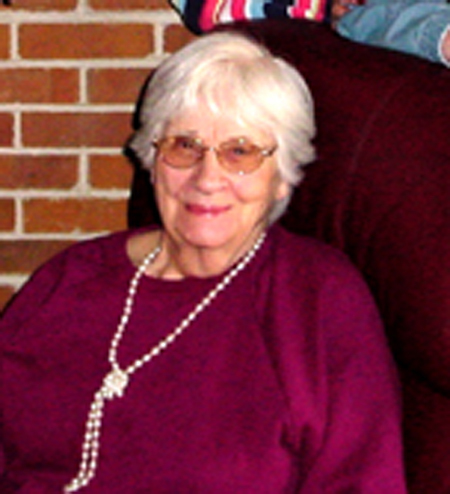 Elizabeth “Libby” (Compton) Basham, 94, passed away on Thursday, September 15, 2011 at 8:15pm at the Mt. Carmel Senior Living Center in St. Charles, MO after a short illness. Elizabeth was born August 2, 1917, in Memphis, TN, the daughter of Marvin Ditzler Compton and Anna Mae (Simpson) Compton. She married John Thomas Wimberly on May 18, 1935 at Texico, Jefferson Co, IL. They divorced in 1969. John passed away on July 30, 2007. Four children were born from this union: Janice, Thomas, Brenda, and Jackie. Elizabeth married Ralph Jennings Basham on May 4, 1988, and he passed away on October 6, 1993 in Elizabethtown, KY.
Elizabeth is survived by a brother, Alfred Marvin Compton, of Peoria, Arizona, and a sister, Ada Blanche Sodders of Mt. Vernon, IL; a son, Thomas L. Wimberly of Marion, IL; daughters Janice Ramelle Evans of Springfield, IL; Brenda Kay Dare (Mike) of St. Charles, MO; and Jackie Lynn Hack (Bob) of Elizabethtown, KY; grandsons Jeffrey Scott Lindner (Paula) of Marion, IL; Shannon Lee Wimberly (Rachel) of Carrier Mills, IL; Steven Michael Wimberly (Cindy) of Roeland Park, KS; Michael Sean Dare (Jennifer) of Wentzville, MO; Jesse Andrew Dare (Gretchen) of St. Charles, MO; and Brad Allen Jones (Tiffany) of Bridge City, TX; granddaughters Jilayne Wood Horn (Dan) of Auburn, IL, Leslie Lynn Pena-Santos, Elizabethtown, KY, Elizabeth Ann Harvey (Jeremy), West Liberty, KY, and Jennifer Lynn Miller (Jeffrey) Elizabethtown, KY; 17 great-grandchildren, and many nieces and nephews. Private Family viewing will be at 1:00pm with graveside services at 2:00pm on Tuesday, September 20th, 2011, in the chapel at the Mt. Vernon, IL Memorial Gardens Cemetery, 3.9 miles West of interstate 57 on State RT 15 with the Rev. Merle Fullerton officiating. Those wishing to attend gather at the chapel prior to the 2pm service. The Baue Funeral Home of O'Fallon, MO is in charge of the graveside services.